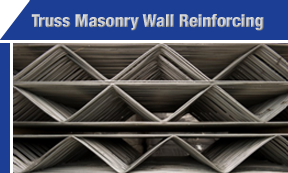 Ladder reinforcement is designed to be embedded in the horizontal mortar joints of single-wythe masonry walls. It is manufactured in 10’ 8” lengths from wire conforming to ASTM A 82 cold drawn steel wire. It consists of two parallel and deformed longitudinal wires welded to a perpendicular cross wire spaced 16" O.C forming a Ladder Style reinforcing. Outside parallel spacing is approximately two inches less than the nominal thickness of the masonry wall. Call 1.866.356.WIRE for more information. Truss reinforcement consists of 2 side-rods welded to a continuous diagonally shaped cross-rod forming a truss design with alternating welds not exceeding 8” (200 mm) O.C. overall. This product is designed to be embedded in the horizontal mortar joints of single-wythe masonry walls. This product is also produced from wire conforming to ASTM A 82 cold drawn steel wire. 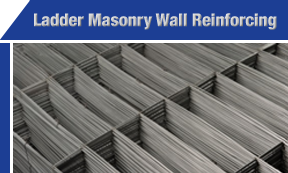 Centennial Wire has been producing Anchoring systems for Masonry walls since 1960. 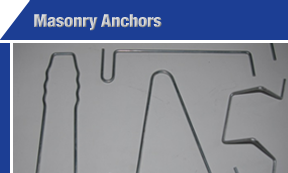 Due to the ever changing requirements within the masonry Industry we are able to custom produce most anchors. With our in-house abilities from Corrugating, Punching and bending flat materials to our in-house wire bending capabilities, no anchor is impossible. Centennial Wire Products Ltd. | All Rights Reserved.